Whips Grate the peel of a lemon in a pt cream, sweeten with loaf sugar, & whip it well. Beat the whites of 3 eggs, & mix with it. Put apple jelly seasoned with lemon, in the bottom of your glasses, & as the froth rises, put in on top of the jelly. Floating island. Beat the whites of 5 eggs till they stand alone, then add a little at a time 4 spoonfuls powdered loaf sugar, & currant jelly, or syrup. 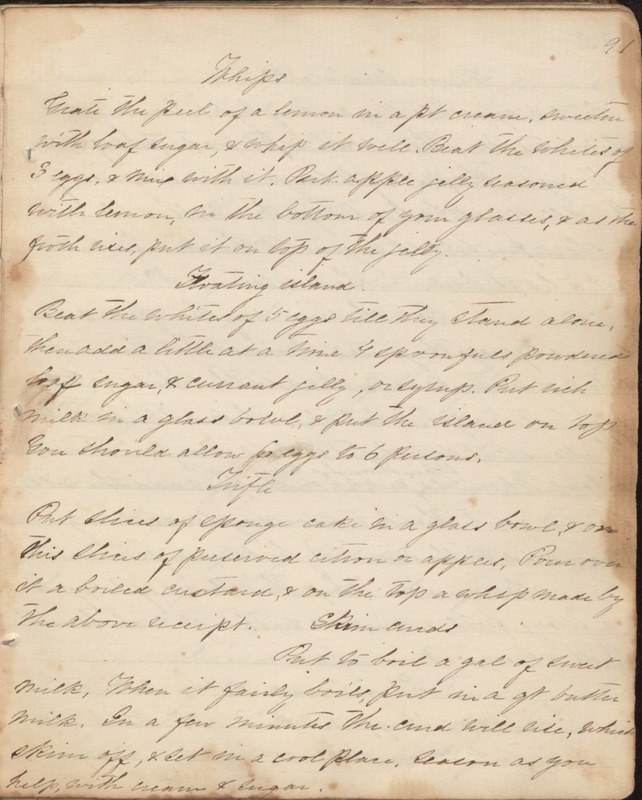 Put rich milk in a glass bowl, & put the island on top You should allow 6 eggs to 6 persons, Trifle Put slices of sponge cake in a glass bowl, & on this slices of preserved citron or apples, Pour over it a boiled custard, & on the top a whip made by the above receipt. Skim curds Put to boil a gal of sweet milk, When it fairly boils, put in a qt of butter milk, In a few minutes the curd will rise, which skim off, & set in a cool place, season as you help, with cream & sugar.